Bhaganagar's research interests include computational fluid dynamics, turbulence and natural systems. (Oct. 17, 2018) -- The American Institute of Aeronautics and Astronautics (AIAA) has elected Kiran Bhaganagar, an associate professor in the UTSA Department of Mechanical Engineering, to the grade of Associate Fellow. AIAA Associate Fellows are individuals of distinction who have made notable and valuable contributions to the arts, sciences or technology of aeronautics or astronautics. 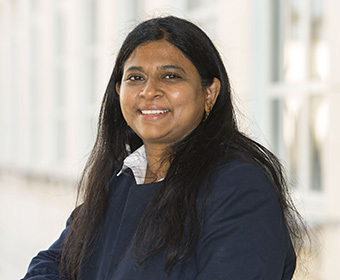 Bhaganagar joined the UTSA faculty in 2009, after earning her doctorate in Mechanical Engineering from Sibley School of Mechanical and Aerospace Engineering at Cornell University, Ithaca, New York. Her research interests include computational fluid dynamics, turbulence and natural systems. Bhaganagar’s election to AIAA Associate Fellow recognizes her notable contributions in the aerospace community. Notably, the UTSA researcher made a breakthrough in the high-fidelity simulation of turbulent flow over complex surfaces by developing one of the first direct numerical simulation solvers (DNS) for unsteady, forcing turbulent flows over rough walls. Her work has become a flagship model for studying the nonlinear instability mechanisms leading to turbulence for aerospace applications and has been applied to complex scenarios such as environmental plume transport, renewable energy and wind turbines in a wind farm and turbulence mixing in stratified atmospheric and oceanic flows. At UTSA, Bhaganagar has led a team of researchers in the Turbulence, Sensing and Intelligence Systems Laboratory in developing a novel early warning system for the U.S. Army. Their innovative system detects the short-term transport of aerial chemical attacks such as the April 4, 2017 Sarin attack in Syria. The researchers solve large-scale numerical models with real-time input by solving the governing equations – Navier Stokes equations –with fine resolution in space and time. These equations are chaotic in nature and are very sensitive to initial conditions. Bhaganagar has developed intelligence sensors to account for accurate conditions to start the numerical model. The group have applied this numerical model for various systems. For example, they have developed a way to evaluate the wake-effects and predict power production of wind turbines at wind farms. The improved predictions result from accounting for diurnal variations (day vs. night), seasonal (summer vs. winter) and topography in their numerical model. This is very important direction for drastically lowering the cost of wind energy. The election to AIAA Associate Fellow is one of a series of recognitions for the UTSA professor. In April 2017, Bhaganagar was named woman physicist of the month by American Physics Society. She also serves as an AIAA Fluid Dynamics technical committee member at the national level and was invited in 2017 for a sabbatical position as visiting professor at Laboratoire des Écoulements Géophysiques et Industriels in Grenoble, France. She has shared her research through lectures across the United States and in European countries of France, Italy, Sweden, Spain including at the prestigious Barcelona Supercomputing Center in Barcelona, Spain. “I feel extremely humbled to receive this prestigious award from AIAA. It is very satisfying to contribute to fundamental science and to apply the concepts to benefit the community. I want to thank the commitment of my group members of turbulence, sensing and intelligence systems at UTSA, who share my passion for fundamental research,” says Bhaganagar about this important recognition. AIAA Associate Fellows are elected annually and Bhaganagar will be formally inducted as an AIAA Associate Fellow at the Associate Fellows Recognition Ceremony and Dinner at the AIAA SciTech Forum on Monday, January 7, 2019 in San Diego, Calif. Learn more about the plume research underway in Bhaganagar’s laboratory. Learn more about the UTSA College of Engineering and its Department of Mechanical Engineering.